My House Amsterdam is uiteraard in Amsterdam gevestigd maar heeft meteen de mogelijkheden onderzocht om in Londen te leveren. Het contact met de interieurarchitect was meteen goed net als met de aannemer. Vergeleken met de prijzen voor Londen met de enorme vastgoedprijzen waren onze prijzen met de transportkosten zeer redelijk. We hebben samen besloten verder te gaan met het keukenontwerp en het interieurontwerp! 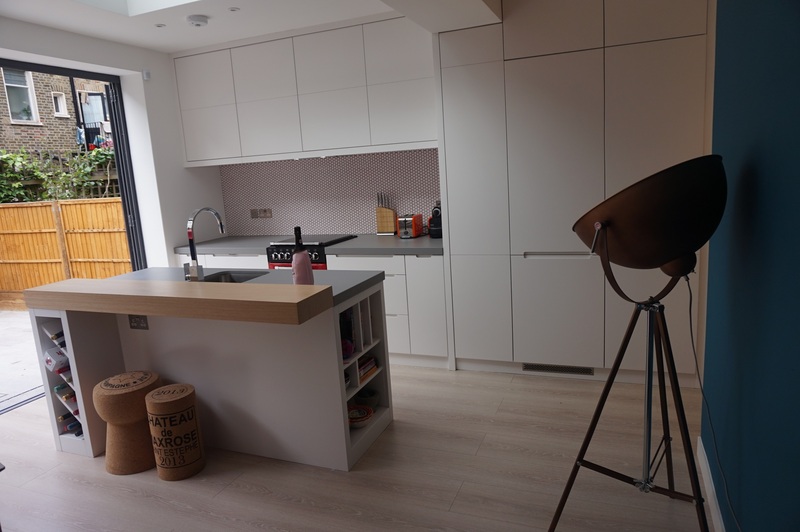 Space is scarce in London, therefore this apartment had to be designed very practical. 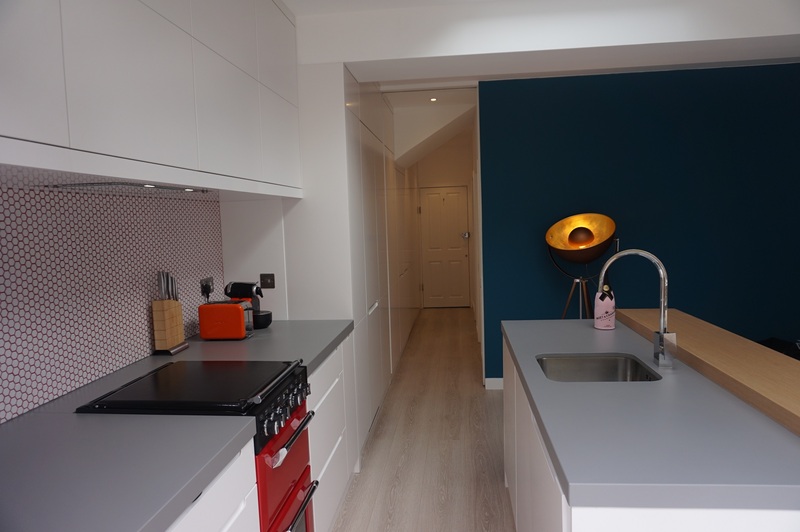 A lot of practical storage solutions had to be created as integrated part of the kitchen and the house. The thing is that the design has to be beautiful and in line with the kitchen, house and total interior. Therefore at My House we always start with the 3D process, meaning after an intake we start designing our products in the space. We adapt them as much as we need. Only after we have the style right we will start the technical designing phase. In this sense it works the same as a London kitchen dealer. The custom designed kitchen was designed with an island and a backwall. The integrated top cabinets are all designed with closed doors. The closed spaces are quiet and in line as they are also part of the living room. The range hood is integrated in this part and is totally integrated. The bottom part has the cooker and the oven as a central focus point. Next to this we integrated loads of drawers. Pay attention at the extra depth of the kitchen. 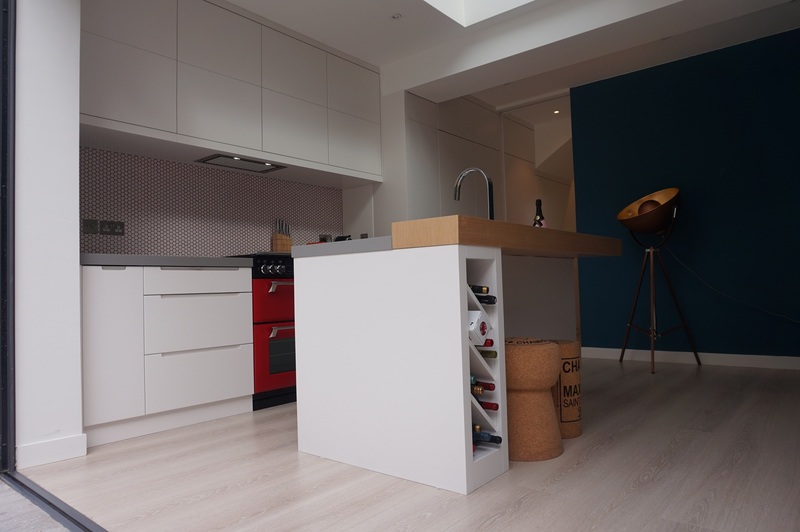 As the kitchens are truly custom made we have created a lot of space. The side of the island is designed as a bookcase, so when you enter the living room that gives a natural look and feel to the space. On the front next to the seating part we have also made a nice wine sorage solution. The sink and the dishwasher are in the island on the kitchen side. The higher part of the island is in oak to give a contrast with the DEKTON. It also serves as a natural boundary between living room and kitchen and stops the water. We choose white as a strong but very modern color. On top we have placed DEKTON in a stark concrete color. This gives a nice contrast to the white. If you look further down the hallway you will find the whole side covered with closed cabinets. 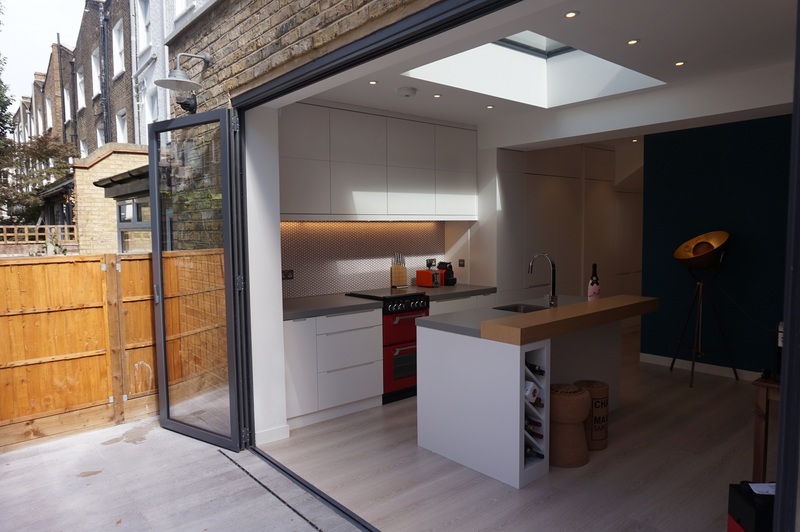 They are the natural extension of the kitchen and go until the front door. They create a lot of storage and the last parts are just blind panels. We have created peace in the design by using push to open systems everywhere. The lining of the doors are in the line with the top cabinets of the kitchen. In this part of the house there are a lot of construction walls and elements that had to be covered. In this stage of the design we cooperated a lot with contractor and interior designer. Measures and possibilities did often not correspond with the design wishes. In the end we managed to get everything right and in line. The design was difficult but definitely worth the practical solutions. Later we have designed a walk in closet in a small side room of the bedroom. The cabinets have loads of storage in the open parts. Take a look on the right side, there the parts are designed slanted for shoes and we have smaller square parts for fashion elements like belts etc. This side is very undeep but serves the purpose. The right side is nearly 60 cm deep and contains all hanging clothes of our client. 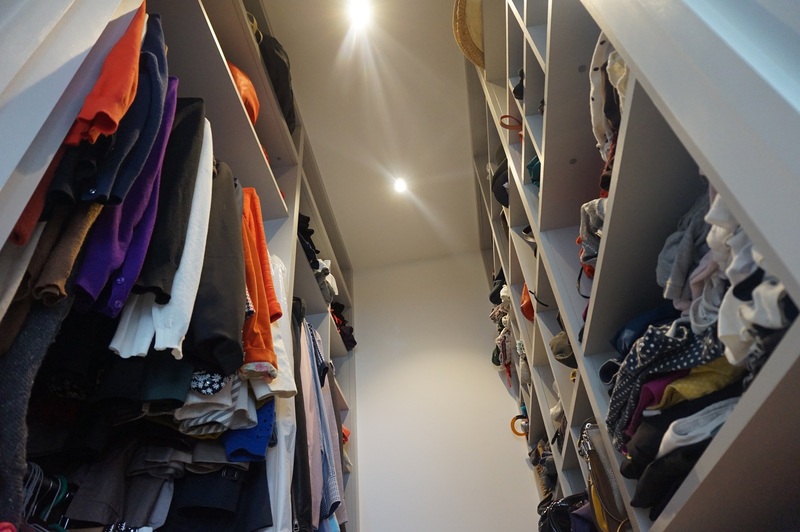 When we first measured the space we never thought that it would be possible, but hey here we fitted a true walk-in closet. The whole design is very modern. The house and its outsides though are very classic. 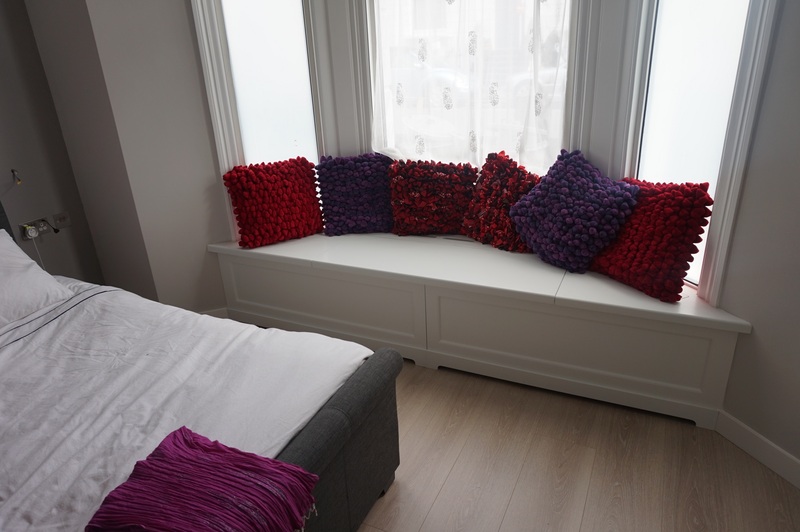 In the bedroom with the nice fireplace we have designed a window bench covering the radiator there. This design is done with nice classical paneling to match the doors in this part of the house. It is very strong and you can sit on the bench in the window and look out the window from the London custom made interior. A nice part of the house is the original thoughts and designs of the tiles. At MyHouse here in Amsterdam we get a lot of questions about the backwall or spashwall of the backside of the kitchen. Here is truly space for originality. Small red diamond structures are chosen here to match the stove and oven. It gives truly depth to the kitchen and attracts attention to the oven as well. Also nice choices are made in the bathroom with the beautifull porcelanosa products combined with nice and colorful Portugese tiles. After the MyHouse interior Amstedam based design the house will be decorated with couches, lamps and other vintage articles. With the modern outlook of the fitted furniture this London apartment will combine very well with vintage and classic furniture, a true eclectic interior as was the Amsterdam-London interior design and service.